Healthy Communities Initiatives – United Way of Central Alabama, Inc.
United Way’s Healthy Communities initiative promotes active modes of transportation, like walking and biking, through its Safe Routes program. Safe Routes works with schools to educate and encourage students to make healthy lifestyle choices, and partners with cities to improve the physical environment to be more conducive for walking and biking. 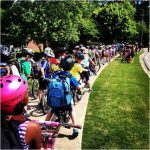 Safe Routes a movement to create safe, convenient and fun opportunities for students to walk, bike, and roll to school. UWCA Healthy Communities has undertaken this work because it has numerous benefits, including: increasing physical activity, improving air quality, increasing safety, traffic mitigation, and increased community engagement. Our school-based activities include Bicycle and Pedestrian Education, Walking School Buses, Bicycle Rodeos, Walk-to-School Days, and providing safety supplies and signage to schools. 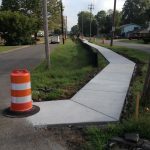 Facilitation of project between the City of Birmingham’s Traffic Engineering, GIS, and Information Management Systems Departments to create new safe-walking maps for 27 schools in the Birmingham City Schools district. Our community-focused partners work together to make improvements so that children and adults have safe places walk and ride in our community. Lead by example and choose an active transportation mode, such as walking or biking, especially for trips less than one mile. Volunteer to assist with a walking school bus or other walk/bike safety program at your child’s school. Drive using caution for those walking and cycling around you. Participate on a community work team to prioritize needed improvements, and advocate to city staff and elected officials. Volunteer to clean/ maintain local parks, trails, and routes. Download the Full Safe Routes To Schools PDF Here.